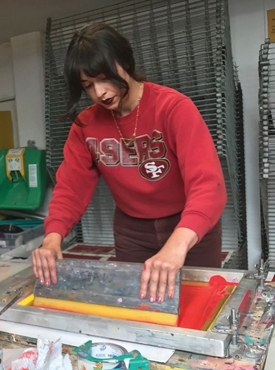 This class is open to everyone from beginner to advanced screen printer working on paper and textiles. Students will learn all the aspects of screen printing from preparation of positives, to screen preparation, burning of images, registration and printing of one or multicolor images. Studio provides instruction, reclaiming area, screens (used on site), emulsion (for one small screen), exposure unit, and studio space. Unfortunately we do not provide or sell any materials. We encourage new students to come and visit before taking the class. Alyssa Aviles was born and raised in San Francisco, California. She grew up in the city's Mission District, a vibrant, cultural mecca that has inspired her creative path. Aviles earned a BFA in printmaking at the Massachusetts College of Art and Design in Boston, Massachusetts. She has given printmaking workshops and classes at the Mexican Museum and MCCLA, curated several exhibitions and participated in various collaborative events. In 2013 Aviles was an artist in residence at Mission Gráfica. She is currently an in-house artist at Artillery, an artist-run collective in the Mission District. This ongoing workshop will introduce you to the stencil method of screen printing. 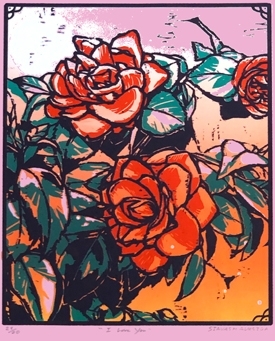 You will use the various image-making methods using monotype techniques, drawing fluid and screen filler techniques and direct-emulsion photographic stencils. You will work with color with multi-run editions and become familiar with the mark-making possibilities of screen-printing while expressing and expanding your own personal style. Beginners welcome. Osh Parsi-Almeida bio coming soon!